CASSIS OOLONG – Always a threat in such company. Has struck a fruitful association with Mohd Zaki. Won last time out and there is no reason why they can’t double the dose. DOMINY – From the low draw, should be able to lead easily. Question is can he go all the way? The 5 f should help his cause. INVINCIBLE MAN – Mixes his form, but from barrier No 1, he may be able to dictate. Should he get a good time of things in front, he may pinch a minor spot. ULTIMATE KILLER (11) – Ran another good race after breakthrough win. Maintaining form and can take a hand in this. Tongue-tie off. GOLDEN YEARS – Beaten short-priced favourite on debut but lost no marks. Will strip fitter for this. Big say. FIRE AWAY – Showed good barrier trial form. Nicely drawn. Won’t surprise if he makes smart debut. GAMELY – Ran decent races in 2YO series, but found the Aushorse Golden Horseshoe too rich. Has made further headway. Winkers Include in calculations. LADY BOSS (10) – Lots of barrier trials under the belt. Fit and ready. She has drawn an alley, which will definitely help guide her along at her first run. Can make the board. LOVING YOU – Precocious filly with plenty of upsides. Scored impressive win at first start as a three-year-old. Can frank that form by going back-to-back. DAZZLING SPEED – After a brilliant maiden win two starts back, could not show the same dash last time out. Looks to be working in great order. Can atone. MOST FAVORITE – Disappointed at two runs at higher grade. Drops back to easier company. Can finish in the money. LONHRO GOLD – Has early pace but may have to be used up to find the lead from the wide alley. Still a worthy contender and cannot be ignored should he manage to lead with little fuss. LORD OF LIGHT – Has performed well in three career runs and certainly finds another suitable assignment. Isn’t ideally drawn but has leading rider Vlad Duric on board, so must be respected. Top pick in an open race. PURE SPARK – Returns from a break and has been ultra-impressive by winning three trials leading into this. Well drawn to perform and will appreciate the booking of Ryan Curatolo. Major player. AYUTTHAYA – Performed fairly well in two runs at the start of the season. Has since had a break and has trialled leading into this affair. Worth thought on best efforts. ITOLDYOUSO – On debut. Has trialled well leading into this affair and will appreciate the claim for his debut effort. Watch for market support. ATTENTION – Finished a close-up third last time out. Will most likely be ridden off the speed from the wide alley in order to let him utilise his turn of foot. Michael Rodd returns to ride, so expect bold showing. SIAM BLUE VANDA (10) – Ultra impressive winner on debut and certainly finds another suitable affair. Glen Boss sticks aboard and appears the threatening material. Serious contender. LIM’S PRIDE – Finished runner-up on debut when well supported in the market. Will take benefit from the run and strips fitter for this affair second-up. Worth some thought. REVOLUTION (11) – Hard to knock on debut effort. Won impressively over the course and distance and finds conditions to suit again. Capable of figuring at the business end with a repeat dose. ETTIJAH – Hasn’t been the soundest customer in recent times with only the one run this year. Has since trialled well leading into this affair and appears ready to go fresh. Must be respected on best efforts. YULONG XIONGYIN – Has developed a handy record in three career runs and still appears to have some improvement left in the tank. Needs luck from the awkward alley but appears the threatening material. MR HANKS – Hard to knock on recent racing. Has recorded two wins in his previous three starts and certainly finds another suitable assignment. The leading jockey goes back aboard so must be considered. RED DAWN – Experienced campaigner who hasn’t been far from the mark in recent times. Needs luck from the wide alley but must be included with a repeat dose of last start. Don’t ignore. WHAT’S NEW – Did her best against impressive winner Bold Thruster at her last start. This looks easier. In the hunt for a long way. BASILISK – Was being hailed the winner until Silent Prince came from nowhere to stun him on the line. Only hiccup is the switch to Polytrack. Has shown better form on turf. Outside chance. HIDDEN PROMISE – On the quick back-up after bouncing back to form last Sunday. All five wins were recorded over the mile. Warrants respect again. SILENT PRINCE – Meets Basilisk 3.5kgs worse off this time, but is still in fine fettle and can give this a shake. Bears watching again. NOWYOUSEE – Fought his heart out but just missed out at his last race. Still in impeccable order and should give some sight again even from awkward alley. FILIBUSTER – Talented mare who seems to have overcome her barrier issues. In her element here and from barrier No 3, she cannot be taken lightly. HELLO MICHELLE – Stuck on nicely for fourth place behind Kiss Your Song and Nowyousee last time. Her feet problems seem to be behind her. Drawn awkwardly. Place chance if she can tuck in somewhere with cover. 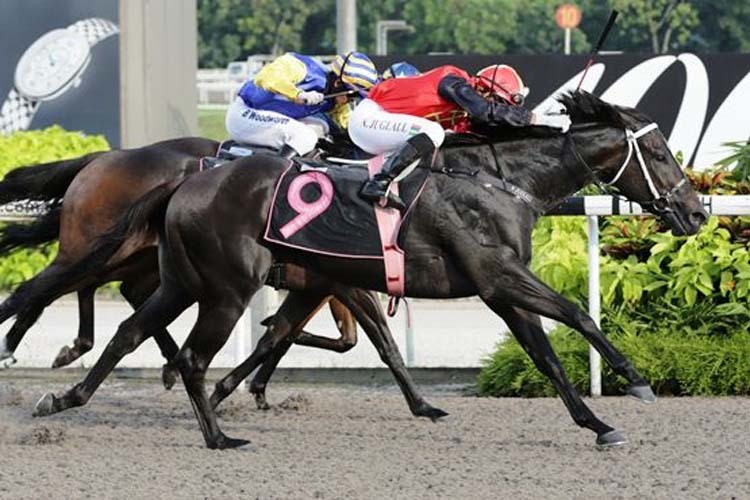 NOVA VOCAL – Did not go a yard in the Singapore Guineas. Tailed off badly after awkward jump. Put a line through that race. Worth much better. Can go well fresh even if the horror gate doesn’t help. LIM’S ZOOM – Consistent performer who has developed a serious record in short career and appears to have upside. Well drawn in this affair and Vlad Duric stays on board. Will take beating. HONOR – Has been knocking on the door in recent times and finds another suitable race. Proven over the sprint trip and appreciates the Polytrack surface. Major player. OPTIMUM STAR – Tends to mix form somewhat but recent racing is hard to ignore. The Derby winning combination of Olivier Placais and Hideyuki Takaoka combine again here and must be included in the mix. UNCONQUERED – Finished third over the course and distance last time out. Well drawn to perform in this affair and will appreciate the claim from apprentice Amirul Ismadi. Worth a thought.